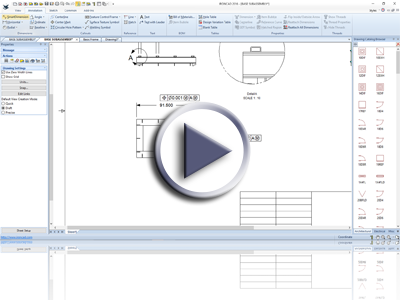 IronCAD Design Collaboration Suite (DCS) 2016 is an exciting release with many customer driven requests to improve your overall design productivity. Using 2016, you will find day-to-day commands that increase your efficiency as well as new tools to explore additional capabilities. 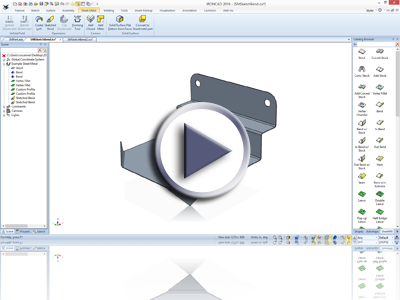 The 2016 release will also improve design tasks related to sheet metal design and fabrication. Many improvements in sheet metal have been added to extend the capabilities in creation and leveraging existing design data to convert into sheet metal. Targeted tools are available to aid in typical fabrication tasks such as Flanges, Steels, Pipes, and much more. Please review the new features below for a more comprehensive list of enhancements in the 2016 release. A new catalog with various standard shapes has been added to assist in creating common objects. 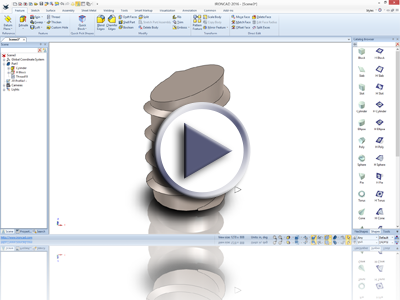 For example: a Belt or a Plate may be a common object that can be easily created but now you have access to a standard shape that can be dynamically pushed and pulled to fit your needs. These objects reduce the overall design time by reducing repetitive tasks found today. Creating copies and links has just gotten easier. Now using the TriBall, you can copy/link to select points. Simply activate the command on a right-click at the center of the TriBall, and select the command. Pick the points you want copy/links located at and your done! Using the TriBall, you have many capabilities to position object to desired locations with easy. The new “Edit Distance From” setting on the TriBall Center and Translation right-click menu reduces the number of clicks to position an object offset from a particular location. Simply access the command, pick a location and set the distance value from that location and your object is immediate placed. Finding the right design variation may have been difficult in the past especially when you had large numbers of variations. With the new Quick search, you can dynamically filter the design variations to particular keywords of interest that can drastically reduce the complexity and display when selecting the desired variation. Speeding up the process to add a design variation, you can now simply select the design variation tab you wish to use and select ok to apply and accept your change. This reduces the need to apply and a second click to accept the modification. 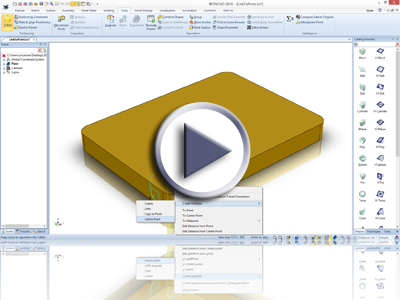 Graphical importing has been improved to support the model edge stored in the Native File format. 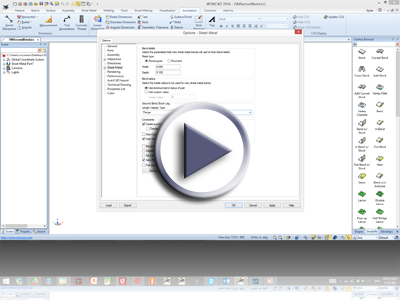 This will allow for better visual appearance and referencing when performing snap operations such as Drag and Drop. Many of the current dimension and measurement commands now work on the graphical imported data. 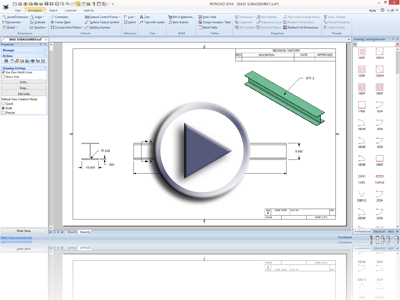 This allows the ability to get rough dimensions of the imported data for use in referencing to/from your design. Did you ever need the ability to create a pattern along the length of an edge but wanted the start and end to be offset a distance? Check out the Pattern Feature command using the Edge Pattern to see the new capabilities. With this new command, you can skip the calculations or parametric rules to drive the pattern. 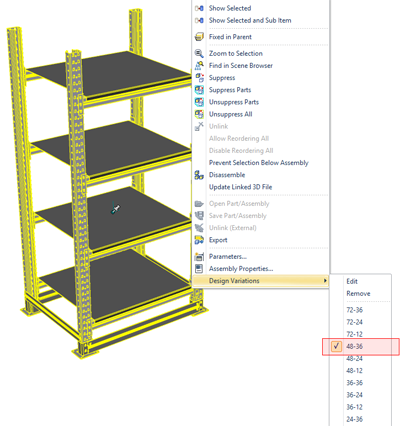 A new constraint option has been added to linear dimensions to define a limit range for your mechanism. Simply specify the maximum and minimum range and the object will be free to move in this range within the mechanism mode operations. 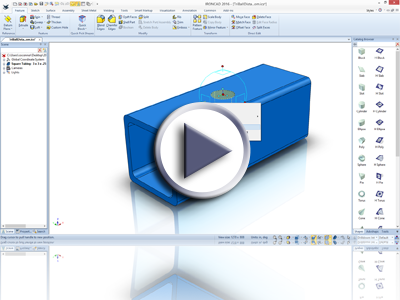 When setting up your IntelliShape sizebox for parametric input, you now have the ability to define the direction in which the sizebox will adjust. 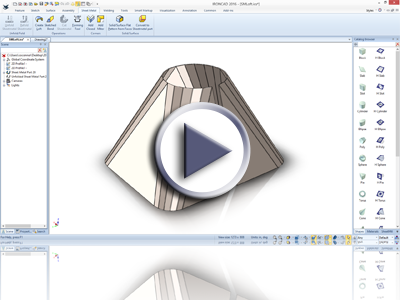 This gives you added control to build intelligent shapes that can be driven by parameters or design variations. 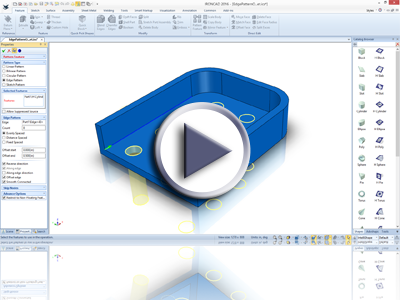 Often when making changes to your design parameters, you will find the need to delete multiple parameters at once. Using the existing selection capabilities in the parameter table, you can now select multiple parameters and delete all selections in a single command. Making incorrect changes to a parameter or expression can occur (not intentionally of course). Now you can use the undo command to undo recent changes to parameter expressions to return to previous states. 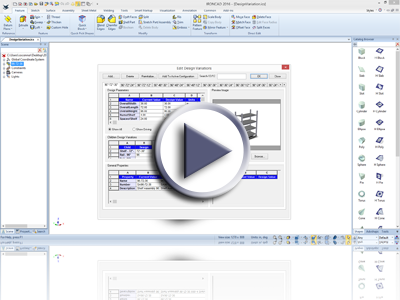 New capabilities have been added to allow you to dynamically control your part number based on variables within the system. 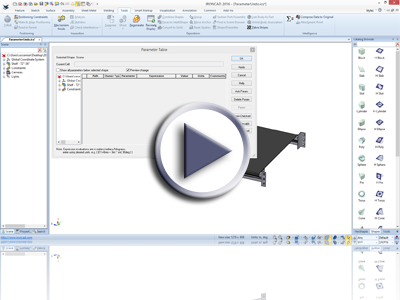 For example: You can configure your part number to be based on a length or parameter values that can dynamically update when the model is modified. 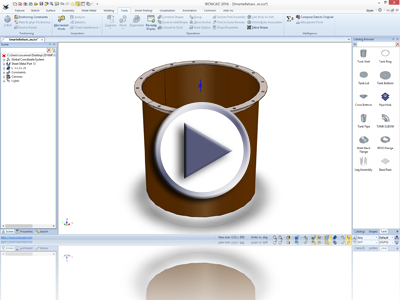 The thread tool has been enhanced to provide additional trimming options for the start and end portions of the thread. In the past, this was a manual afterthought operation. With the new setting, you can save time in the creation and editing process by inputting rules for the trimming behavior. The Assembly Feature command has been improved to support both Innovative and Structured parts. 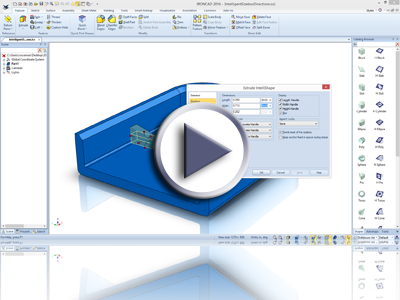 Both part types can exist in a single environment and you can now use the single tool to drive assembly operations to both part types reducing the manual creation process at the part levels. Typically in commands such as Blend, Chamfer, Shell, and Draft, you may find that you are selecting many objects to be used in the command. When you are looking to edit these selections, you would end up spending time scrolling up and down in the edit boxes in the property browser. Now you can simply drag and grow these edit boxes to get a much better visual representation of the details contained within making for better selection and editing. 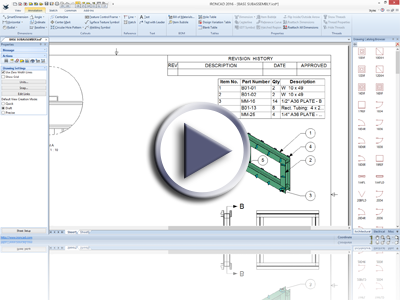 Based on the proven IronPRO XT add-on, users worldwide can purchase the IronCAD Mechanical add-on which contains numerous productivity and creation tools that are well suite for all users but especially useful to fabricators. Tools are available for piping, steels, flanges, intelligent fasteners and many productivity functions. 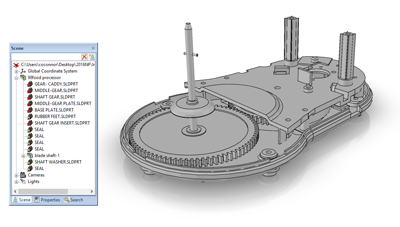 Using a sketch reference line, you can now fold a sheet metal part based on this definition. 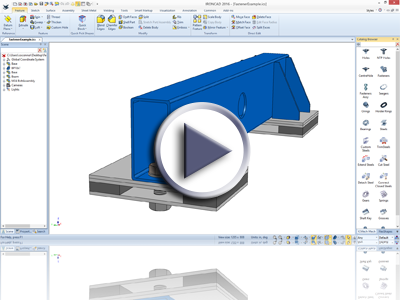 This gives you more capabilities to bend corners or even to rebuild sheet metal from a 2D Sketch imported from DWG/DXF. You can select a single line or multiple lines with varying definitions to build simple to complex folding rules. 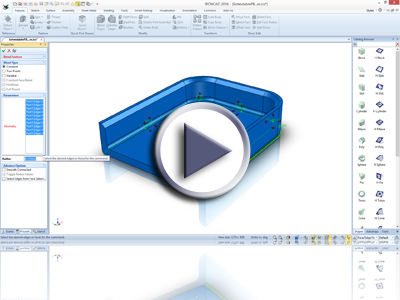 Using the existing unfold a solid/surface command and the sketch bend, we are able to provide a new command to convert existing solids and surfaces (or even imported sheet metal) to an IronCAD sheet metal feature. Once converted, you can continue to edit the sheet metal part as if it was a native sheet metal part. New settings have been added to allow for lofted sheet metal (for arc to arc, line to arc loft) to define bendlines based on press break forming. This will generate bendlines that are used for the press break operation on the drawing with specified values. 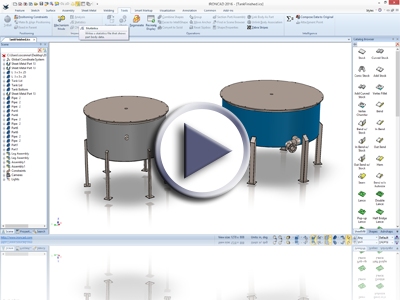 New catalog provided to allow the creation of tanks with piping, flanges, and lids that can be used for manufacturing or as examples how Smart eBEHAVIORS can be used in a real example. 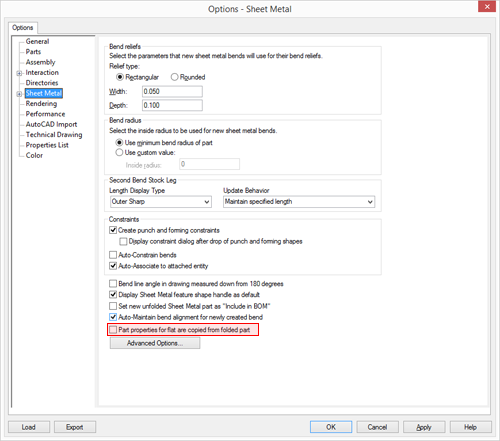 When designing sheet metal in IRONCAD, it is common to set bend legs lengths using the handle user interface. In 2016, users can now define if the values of these handle reference the inner, outer or tangent locations. This reduces the need to use commands such as edit distance from point. 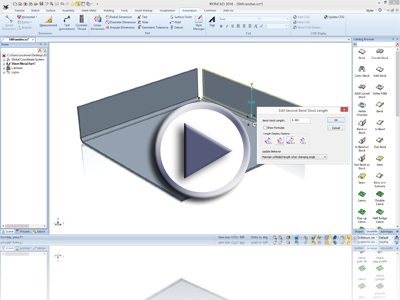 When changing a bend angle, users can now define if material is added or not to the end segment to account for the angle change. In previous versions, the unfolded sheet metal part was restricted to be at the same level and location as the folded part. Now you are able to have the unfolded part at different levels and the unfolded part can be moved within the scene browser. This give users more control to define the scene structure and store the unfolded parts in desired locations. 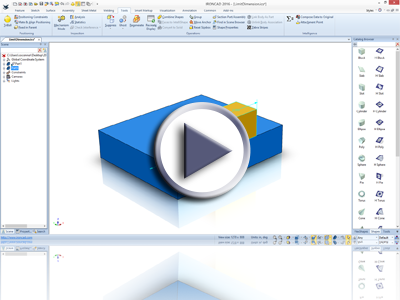 Users now have the ability to automatically share the part property information (part number, description, custom properties) from the folded part to the unfolded part. 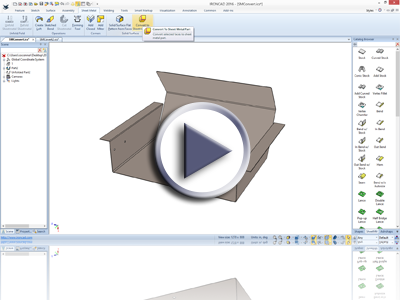 This allows the ability to use a single source for the data and leverage it on the drawing from either the folded or unfolded part. Similar to the Save Catalogs for Mobile, you now have the ability to save your design catalogs as lightweight. This will store a graphical representation of your objects in the catalog with reference information back to the source design data. Opening these catalogs in COMPOSE or even IRONCAD/INOVATE, will allow you to design with a secure representation but at a reduce data size. 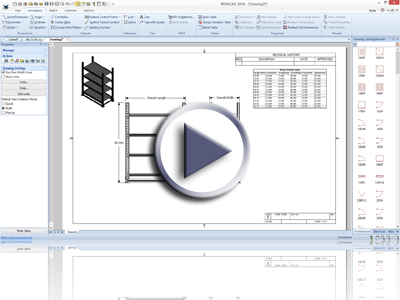 At anytime, you can load the source design data as long as you have access to the original catalog. 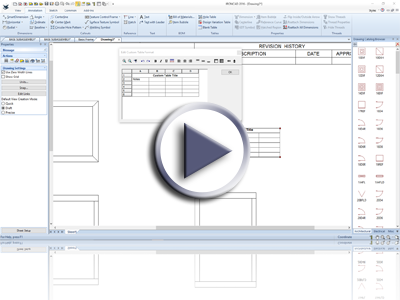 Using this approach allow you to make use of COMPOSE to demonstrate how to configure a design or to limit editing capabilities to users that may not have permissions to access the source design data. 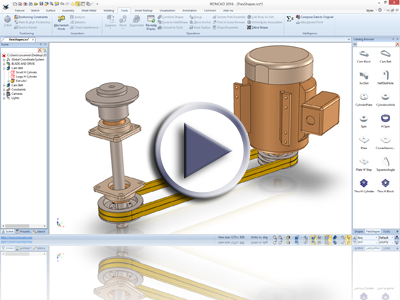 New in 2016, you can save a part/assembly that contains a design variation to a catalog. 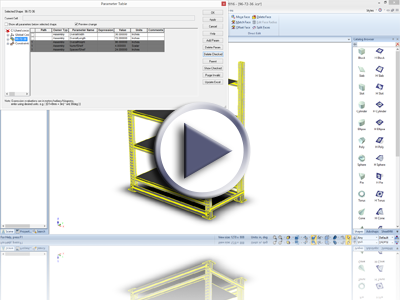 When exporting the catalog as Lightweight or to the Mobile, the system will automatically convert the design variation component into a group containing an element for each variation. This allows users on COMPOSE or the Mobile, to make use of the individual variation and it will allow you to convert the lightweight versions back to the source design at the particular design variation state. Extending the current capability on Smart Assemblies to drive object parameters by setting values, we now have the option to set expressions. This allows you to drive objects by expressions from the object you are dropping on. 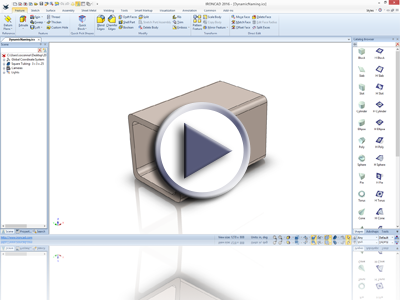 Therefore, when the original object changes parameters, the connected object from Smart Assemblies will update as well. Users have the ability to store objects in groups. These object can be any design and do not necessarily need to be parametric. Smart eBehaviors have been added to define a particular object based on the catalog item name in a group. For example: You could create a group with a block, cylinder, and cone which all have an attachment setting for Smart eBehaviors. When you drop the group, using the attachment naming you can define the dropping object based on its catalog item name. 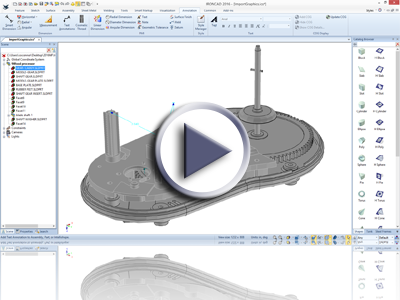 The Smart Assembly behavior has been extended down to the IntelliShape level to give extend capabilities. Adding attachment points at the feature level give you more control to reposition features, create links/patterns and suppression. Now with the extended support, you can build more intelligent designs based on changes at the feature level. Note: Adding constraints through the Smart eBehaviors is not supported at the feature level. In previous versions, you had to understand the string definitions in order to fully build the attachment points to work as part of the Smart eBehaviors. In 2016, an Intelligent Creation Tool has been added to simplify the creation and to provide feedback for various actions like parameter referencing. Using this tool you can verify the string naming based on verification feedback provide within the tool. When selecting a design variation on drop or through the right-click options, the last selected state will be remembered. 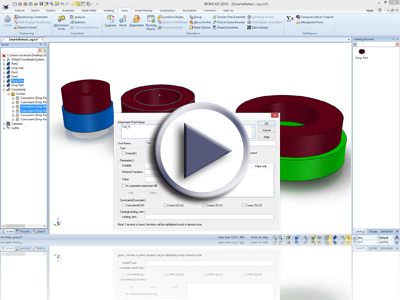 This allows you to visually inspect which design variation was selected and allow better visualization when performing the convert to design data from the lightweight catalogs. Datum Features and the Datum Feature Control Frames can now be attached to dimension extension lines and can be placed in locations with respect to the dimension value. Enabling the commands and selecting a dimension will associate these entities to the dimensions. When the dimensions update, the Datum Features will update as well. Support has been added to allow the structural steel information to be transferred to the ICD BOM similar to the DRAFT BOM. The ICD now supports the ability to insert a Table object that can be edited and formatted to meet your detailing needs. Use the table for Revision blocks or just as a reference container for communicating detail instructions. 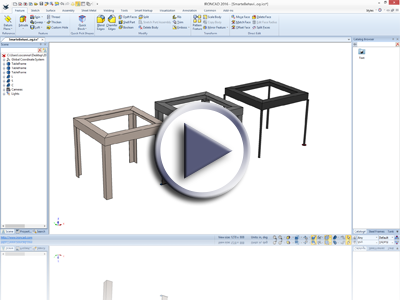 New in 2016 is the ability to create a table based on a Design Variation stored on a part/assembly. This capability allows you to create a reference drawing view that you can manually refer to tabular information for calling out size information. The ICD has been enhanced to support the ability to define text properties based on the sheet number. For example: You can now specify Sheet # of # in the title block. When you insert new sheets, the information can automatically update to reflect the total number of sheets and the current sheet. 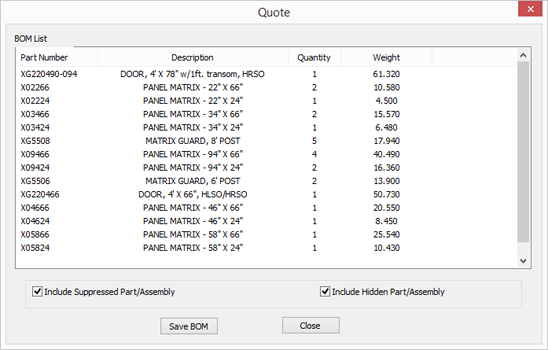 Using the Text Property capabilities and having a BOM in a given ICD, you can now access the quantity for a selected part/assembly. For example: you can have a call-out on a separate sheet (not containing the BOM) that lists the quantity for a selected part. When exporting and printing, often you may set various setting that you will commonly use in the process. These settings for Print and Export on the ICD are now stored and remembered when you access the commands again saving time by reducing the repetitive tasks. More Rich Edit controls have been added to the ICD’s text boxes allowing for commands such as Bullets and Paragraph indention. This new control give more flexibility in creating text information for communication. Additional default styles have been added to the Welding Symbol style in the ICD. 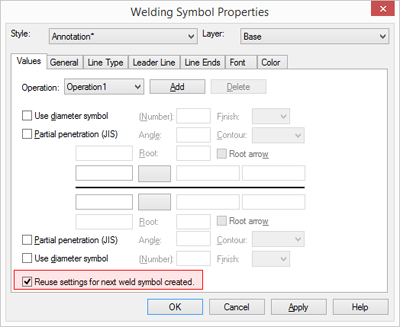 These new styles allow you to specify additional common settings for the weld symbol reducing the work to enter information on new created weld symbols. It is often common to create similar weld symbols in a drawing. A new option has been added to remember the last set information for the welding symbol so that the next created element can automatically reuse the previous settings. The leader line for weld symbols has been updated to dynamically adjust right/left based on the placement of the welding symbol. This makes the placement and editing of weld symbols easier due to the automatic updating of the leader location. Many improvements have been made to the integrated Multi-Physics for IronCAD product. Faster solver, better boundary condition for intuitive display feedback, and new meshing to filter out tiny unintended geometry automatically are all included. In addition, a new reporting capability has been added to create a meaningful report of your analysis to share among your team. 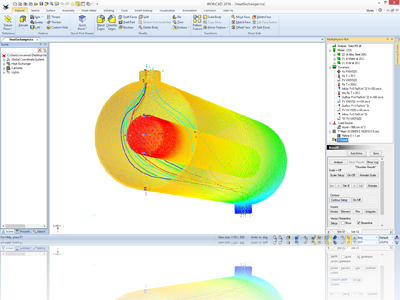 Add on the new Fluids option to take your analysis to the next level! Run full multi-physics with stress, thermal, electrical, and fluids with simplicity unmatched in the industry. 2016 will now support the latest release of Keyshot version 6 giving users access to the latest improvements and capabilities. Simply install IronCAD DCS 2016 product and the KeyShot 6 product, and you will be ready to take advantage of the KeyShot for IronCAD! Contact your local IronCAD representative to talk about purchasing options. Note: You must have a purchased version of IRONCAD, INOVATE or IRONCAD DRAFT in order to purchase the KeyShot for IronCAD integration. 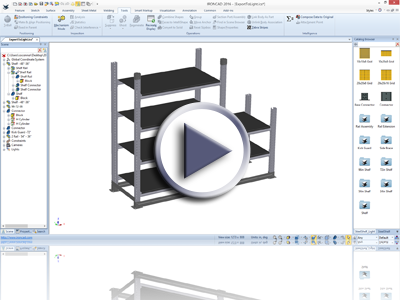 Using the IRONCAD COMPOSE Mobile application, you are now able to multi-select object and use the Move tool to reposition them in one action. This can save tremendous time when testing out new variations or layouts of a design. When testing multiple iterations of a configured design on the Mobile COMPOSE, you can now select multiple object to delete allowing you to quickly add and remove objects to try out new concepts. The latest version of the Mobile COMPOSE now supports Textures/Decals that are stored in the Catalog objects or ICSW files. This allow greater visual appearance for your files on the Mobile device to better communicate. 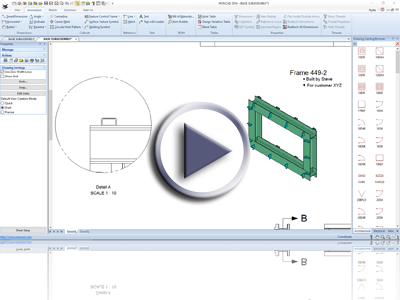 Export to 3D PDF now supports the ability to export to different layout orientations (portrait and landscape). Communicating your design information has now been improved using the Query Tool. The interface now can present information closer to a BOM look with options to export the data to CSV formats for downstream use. 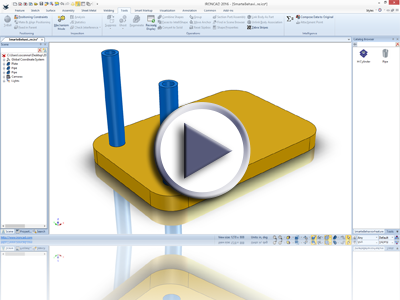 Part Number, Description and custom properties (set to Values) will automatically appear in the Query Tool display. 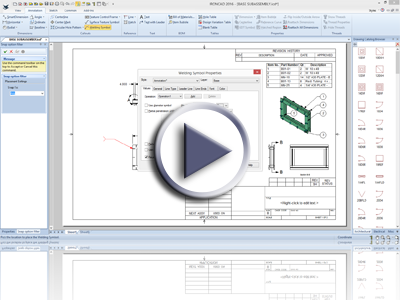 With the latest release of the IronCAD DCS, you will have access to the latest versions of CAD file formats using our Native Translator. Version support has been enhanced in most major formats that are listed below. 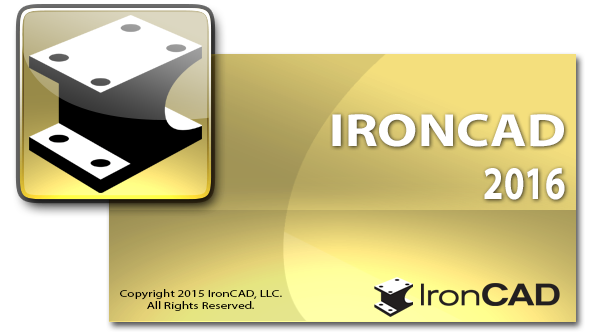 Future product updates provided by IronCAD will automatically notify you of the availability allowing you to download and install. No longer will you need to notified by your representatives or the community, just simply start the product and you will be notified if there is a new version ready for you.